Michael's newfound fame gave friends and family and idea to set up a crowdfunding page to help the Keatings pay for a handicap accessible van. ELVERSON, Pa. -- When the Bishop Shanahan High School Band was invited to play for the pope as he arrived at Philadelphia International Airport last month, the band director brought his entire family to share in the moment. As millions watched on TV, they saw Pope Francis kiss and bless his son who has cerebral palsy. 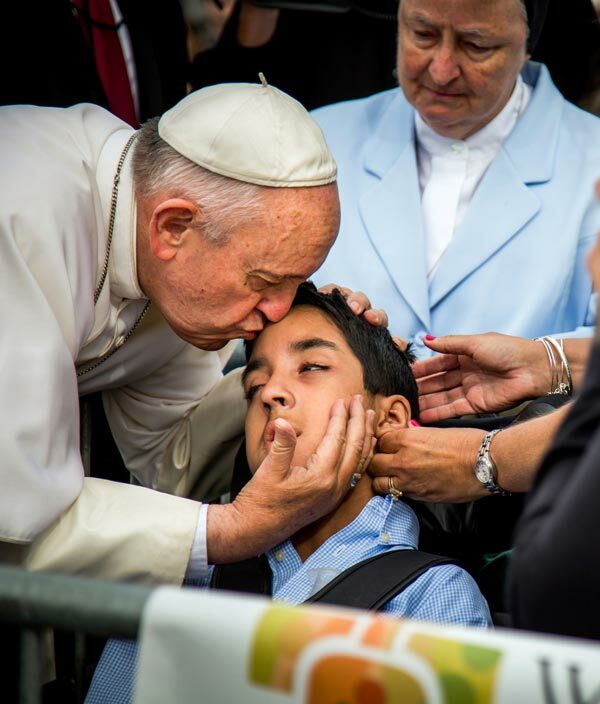 FILE - In this Sept. 26, 2015, file photo, provided by World Meeting of Families, Pope Francis kisses and blesses Michael Keating, 10, of Elverson, Pa. While that was remarkable enough, the Keating family soon learned that was only the beginning. "It's overwhelming, but it's just amazing," Chuck Keating said. Chuck's wife Kristin says she almost couldn't believe what was happening. "Out he came and he really beelined right for Michael. He didn't look up at any of the adults in the area, just came right to him," Kristin said. Michael's newfound fame gave friends and family an idea to set up a crowdfunding page to help the Keatings, who are both teachers, pay for a handicap accessible van. Michael is 10 years old now and getting him in and out of their family vehicle is becoming difficult. It is especially tough for Kristin who recently underwent her second hernia operation. "One of the doctors said to me, 'If Michael was your job, you would be disabled. You would not be able to do the job.' I said, 'But I have to,'" Kristin said. At first, they were hoping to raise enough for a decent down payment. But as of Wednesday afternoon, hundreds of people have pledged more than $114,000. $50,000 of the total raised comes from director J.J. Abrams. Chuck says he and his family are simply overwhelmed. "When you see some of the comments by people...you always hear about the bad things in the world, but now this gives you hope that there are so many nice people and so many generous people out there," Chuck said. And Kristin is hoping this story inspires everyone to help a family with a disabled child. "So just drop off dinner one night or tell them you're going to pick up their child from their after school activity. Anything little means so much because so many times families like ours do feel alone," Kristin said. When Chuck was asked how it feels to finally have the resources to truly bless his son, he said he is really just returning the favor. "Michael is the one who blessed us and now we're seeing it all coming together. It's truly amazing," Chuck said. The van will cost at least $50,000 and anything left over will go to upgrading the ramps and bathrooms around the house to make them more accessible to Michael. If you would like to donate to Michael's cause, you can do so by visiting https://www.crowdrise.com/fundraise-and-volunteer/donations/michaelkeatingblesse/friendsofmichael.